This began as a Facebook entry but grew like Topsy¹. On reaching the Blighty shores we were struck immediately by the increased cost of eating out, a habit we acquired in China. If you were grade meals as seated posh, seated plain, seated naff and street standing then in China you’d be one or more steps down for the same money in Britain. I’ve eaten a two course meal for two with beer for ¥40 seated and warm, regularly ate takeaway street supper for ¥8 (which fed me two nights); in China, PizzaHut is a special night out—and its prices are similar in China to those in Britain; less, but still similar. So we were struck by observations of occasions where the reverse was true. We already were aware that many electronics are cheaper in Britain, even if made in China – and no idea how that can be so. A similar case applies to the pharmacy, where all sorts of diet supplement pills and the like are about half the price of the same thing in China. Many foods are consistently cheaper in Britain than in China. Marmite, because it sells in bulk and it is made here; cheese, for the same reason; British beer for distance reasons, obviously; wine, I think because of taxes, volume and proximity to Europe; ice cream (and, C notes access to variety of flavours, especially mint chocolate). Then there are some outright surprises:- some rice, cheaper here for the same thing in the same sort of supermarket; some tea, where the ordinary everyday tea is cheaper here and some of the ‘quality’ teas are too – but then we don’t have the huge variety (of tea and rice), nor the market that will pay ransoms for these foods. On the list of things that are made in China that aren’t for sale in China are many of the things made for export—so the electronics quoted above, but also, surprise, trainers. I commented back in ZhouQing (2009) that the shoes I bought in Hong Kong were made 15km from where I lived but unavailable there. The few sold were the factory rejects that crept out ‘under the wire’, so to speak, and were sold from the boot of a car in a very ad hoc manner. That is, I’d see a car parked on a roadside verge with shoes laid out on the ground and a small crowd poring over them². Since, always, I was out running, I’d not bother to stop, having no money and good shoes already. Cars are expensive in China - for the same thing. That’s mostly a tax matter. There are cheap cars, but running a car is expensive. Oft said in the PRC is that the government wants you to have a car, just not to run it on the road. Similar costs in both countries: fuel, once you allow for toll charges on roads. In general, things which both countries have to buy in, things which are taxed heavily (jewellery3, for example). Expensive in Britain but cheap in China; all types of labour. Indeed, many of the things which are cheap there are because of exactly that factor. Then there are the things you do or don’t buy. Or do. Not so much cheap/expensive as merely missing. Things you don’t do in China include buying land and paying for insurance. Things you don’t do in Britain include putting external bars on your windows in Britain and opening all the windows for an hour or so every morning, whatever the weather [see Fresh Air]. take ¥10 = £1. It’s close enough because there are rounding errors to consider, too. 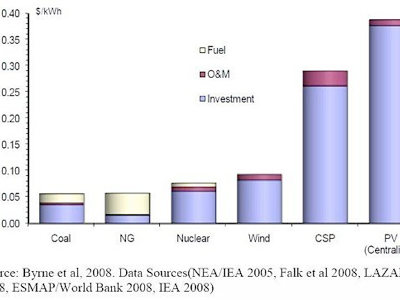 The relative generation costs of the principal energy sources in the UK are a source of constant debate. There are numerous ways of approaching the issue. In the following feature, David Milborrow sets out to compare generation costs from coal, gas, onshore and offshore wind and nuclear using realistic inputs for plant, fuel and operation and maintenance costs, both for now and for 2020. It suggests there is little to choose between gas, coal and onshore wind in either case. 1 Topsy, character in Harriet Beecher Stowe’s Uncle Tom’s Cabin. “I expect I grow’d” she said, in response to an enquiry about whether she knew of God (“Who made you?” sort of question). Is it better then for me to say my entry grew like the beanstalk in Jack’s pantomime? 2 Or does a chinese crowd pour? Or paw? For that matter, does one person pore? Is that the right word? 3 spelling issue here; jewelry considered to be the US version. On this occasion I typed the US version. Now there’s a first.